Do you have a pasty white skin, ghostly color, or pale complexion? If you do, then you must have considered getting a golden tan. Tanning isn’t always easy for those who have fair skin. There are countless of tanning salons and tanning products out there with the promise of giving you an attractive tan. But with tanning products being offered left and right, how do you know which one is the best for you? Before we introduce the bed tanning lotion featured in our review, we’re going to give you a rundown of some of the things that you need to know about skin tanning. Improves your physical appearance by turning your skin into shades of gold and brown. Improves your mood and overall well-being. Helps you get a healthy amount of vitamin D.
Can help treat certain disorders through the exposure to UV light. Sun Tanning - One can get a natural tan from being exposed to the sunlight. Our skin has melanin pigments that absorb ultraviolet radiations from the sun. When ultraviolet radiations are absorbed, a physiological reaction occurs that transform the skin into darker shades. Sunless Tan or Self-tanning - This is a form of artificial tanning since this process involves certain chemicals applied to the skin to make it look like it was tanned naturally under the sun. Indoor Tanning - You can also get a tan from exposure to artificial UV radiation from a tanning device usually offered at salons or spas. These pieces of tanning equipment used in indoor tanning are sunbeds and sun booths. Many prefer indoor tanning since it involves no risk of overexposure to the sunlight. This prevents you from getting sunburned while still getting that even tan. With these three processes, you can effectively look like a model from a magazine with gold or bronze tan. Achieving the perfect cosmetic tan can be accelerated with the use of tanning products such as suntan lotions. Suntan lotions contain properties that speed up the production of melanin which then accelerates the process of tanning. Tanning lotions are commonly recommended when tanning indoors and outdoors since it provides skin nourishment, hydration and oxygenation. It is important to consider getting a tanning lotion since most of them have moisturizing properties that your skin will need. Tanning gives you a shade darker than your original skin tone. On the other hand, you run the risk of dehydrating your skin. Tanning lotions work to keep your skin refreshed and replaces the lost nutrients and hydration. Choose your tanning lotion wisely and pick one that can meet the needs of your skin. 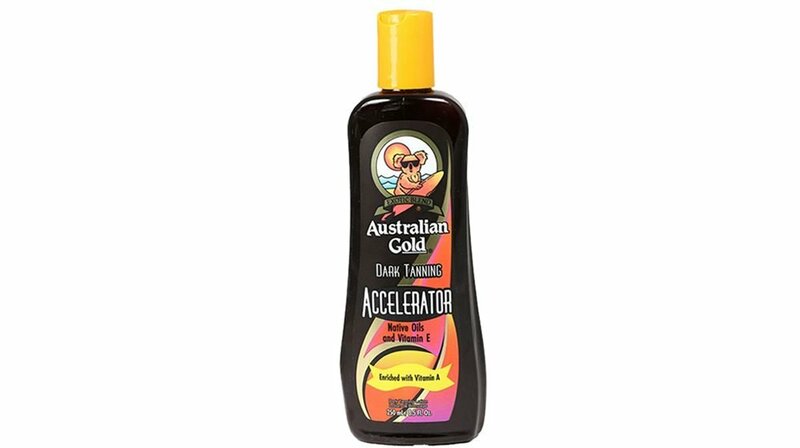 Check out the review of Australian Gold’s Tanning Lotion to help you with your choice. Looking for a tanning lotion that comes with a bronzer? Look no more since Australian Gold’s Cheeky Brown Accelerator comes with bronzer. This product offers a great tanning experience with its advanced formula. Your skin will love this tanning lotion since not only does it keep it hydrated, but this lotion is also enriched with native Australian oils and vitamins A and E. It can also be used for indoor tanning or outdoor tanning, whichever you prefer. This particular Australian Gold product promises fast tanning results. This lotion is scented with ‘’cocoa dreams’’ fragrance that reminds you of fun times at the beach. See yourself in a new light, or rather, see yourself with a new tan with the help of this Dark Natural Tanning Lotion with Bronzer from Australian Gold. Handy and convenient bottle. It can be placed inside your bag without taking up much space. Reasonably priced and cost less compared to salon products. Great option for producing a base tan before a tropical vacation. Produces an even caramel color that can be enhanced by other tanning methods. Leaves no stain on clothes since it doesn’t have a tint. Absorbed into the skin quickly and doesn’t feel sticky or greasy when applied. ​Effectively produces golden brown tan 1 to 2 shades darker. Spreads evenly and feels great on the skin. Sweet scent of the lotion stays even after applying it on your skin. Stain marks can be caused by the bronzer if not handled carefully. The smell can be too much if you are not fond of sweet scents. Not what I expected. Very runny lotion. Does not have a bronzer like it says it does. I am very disappointed. Glad I didn't pay more. ​Tanning effect is more visible with fair and light skin types compared to brown skin types. Lotion does not contain SPF properties for protection against sunburns. First of all, we’d like to commend this product for its reasonable and affordable price. Tanning salons sell tanning products that cost way more. If you want to get a nice tan but you don’t want to spend a fortune, then this product is the ideal one for you. This tanning lotion also comes with bronzer which is a huge plus. It is great for the skin given its hydrating properties. You can apply this lotion anytime, anywhere since it works for both indoor and outdoor use. What we particularly love is that we can accelerate the tanning process by applying this lotion without feeling like we’ve been slathered with butter. The smell is something that can be judged by your own preference. However, we personally love its pleasant fragrance. Overall, this product is worth recommending.